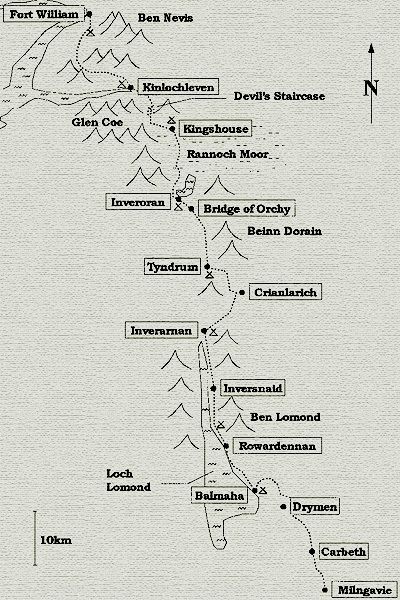 In the last week of April 1997 I went on a short trip to Scotland, to finally walk the West Highland Way. This long distance path stretches about 154 km (96 miles) from a small place called Milngavie on the outskirts of Glasgow, all the way up North into the Scottish Highlands to Fort William and Scotland’s highest Mountain, Ben Nevis. All images were taken on 35mm AGFA slide film. On the map to the right (click to enlarge) you can see the route and the places where I spent the nights – most of the time in my tent. The path is well maintained, navigation in good weather is very easy, and there are lots of campsites along the way. Unfortunately, in the summer it is also well known to be very very crowded. Especially since most stretches of the path – exept the northern part of Loch Lomond – are within reach of roads and villages, one will encounter rather many day tourists. To avoid the peak season I started early in the year – and indeed this reduced the number of people I met to a maximum of 10 to 15 per day. 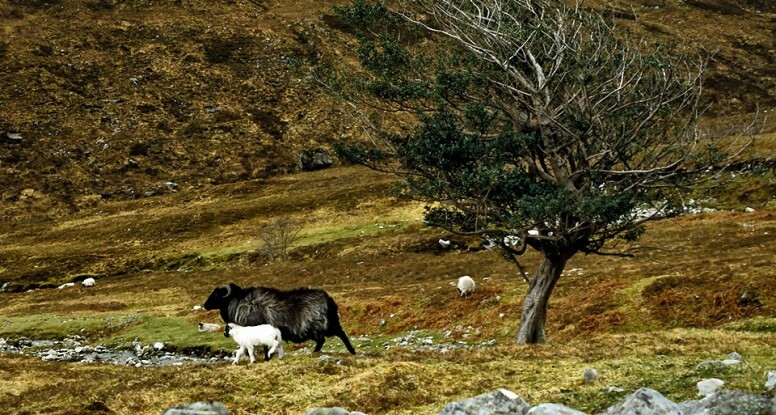 If conditions are good, You can easily walk the West Highland Way in 4 to 5 days. But there are many things and places to enjoy along the way. So it is certainly worth it if you allow for somewhat more time. I myself spent 9 days walking, and included the summit of Ben Nevis in my route.